This picture is of a Water Managment Unit (Hose Layer). Scania P94-300, Body by Woodwards and Hose retrieval unit by Angus Fire. Added by Nathan Smith on 13 December 2006. A very impressive fire appliance. 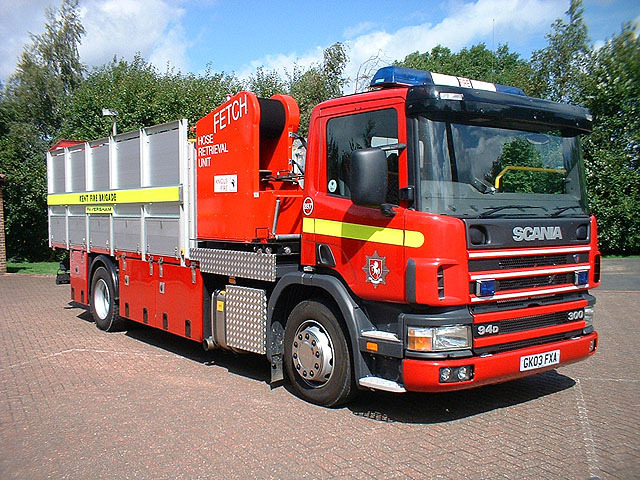 Some fire brigade in UK mount their WMU (which look like this one) on Volvo FL 2-axle chassis. Added by Bomba Boy on 14 December 2006. An airport in UK own the Scania HRU for hose laying activity. Added by Bomba995 on 14 April 2007. Have never seen a crew too enthused about recovering a great length of wet Large Diameter Hose by hand. And in winter, another problem with it all freezing up solid - have to gather up in great awkward heaps on open truck bed [often a Volunteer's own transport]; then get it to Fire Hall to thaw, uncouple and drain, for restowing. Australia's hot, dry, interior looks real good then. Added by Pat_R-B on 20 April 2008. Wayne, I don't quite understand how this thing works? Added by Pavel on 25 April 2008. If you go to Angus Fire web site, look up Hi Volume hose and then Fetch system this will explain how it works. Added by Wayne Davies on 26 April 2008.